Driving home from this year’s CACIB of the VDH Hessen in Gießen we were very happy with the results. 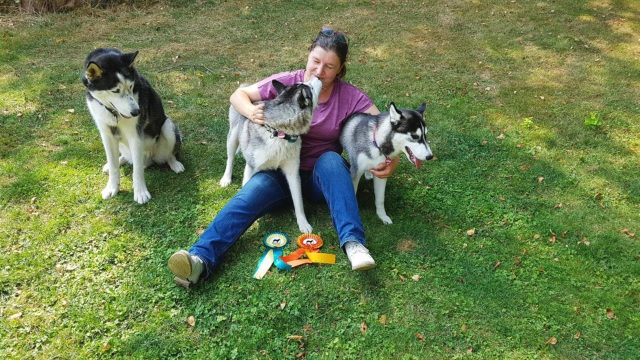 We had entered our young girls Ezri (Zaltana Kissed By An Angel In Kahnawake) in Puppy Class and Opra (Inner Vision Wolfblood) in Intermediate Class. Both girls had starte to blow their coats in the summer heat, therefore Opra entered the ring naked, Ezri with a very thin coat. Even ring training and dog sports had been neglected due to this long period of heat. Nevertheless, Ezri proved herself smart enough, didn’t act clumsy at all in the ring, but easy and focussed, and she showed her smooth gaiting. And so breed judge Gabriele Richard (DE) awarded her with a “Very promising” and in the end she left the ring as winner of the Puppy Class, i.e. BOBP. Opra is an eperienced show dog. She didn’t care about looking a bit like a plucked goose. She, too, scored with her beautiful face and her wonderful gaiting and was assessed “Excellent” particularly for her gaiting. So I didn’t care at all that due to her poor coat there was no chance for us in the rounds for the Best Female. With the two girls being pretty groggy due to the heat, and their colorful ribbons, we returned home happily. A big thank you goes to the hosts, to show management Ute Berger and breed judge Gabriela Richard! And another big thank you to Angela Tagliaferri for grooming and Tanja backes for training us! Herzlichen Glückwunsch den zwei Mädels. Sag mal, warum kriegt denn der Sisko nicht auch mal so eine schöne Schleiffe? Der schaut ja schon ganz sehnsüchtig auf die Trophäen… dabei ist Sikso der *allerbeste* Hund von allen! Bestes Gangwerk. Bestes Puschelfell. Besten Betteblick. Bester Humor. Beste Türöffnungstechnik. Beste Rüdenpose. Beste Erziehungskompetenz. Bestes Alles! Sag mal, warum kriegt denn der Sisko nicht auch mal so eine schöne Schleife? Der schaut ja schon ganz sehnsüchtig auf die Trophäen… dabei ist Sisko der *allerbeste* Hund von allen! Bestes Gangwerk. Bestes Puschelfell. Besten Bettelblick. Bester Humor. Beste Türöffnungstechnik. Beste Rüdenpose. Beste Erziehungskompetenz. Bestes Alles! Now, I’m sorry for all the spam. Let’s translate. Congratulations to the two girls! But tell me why there are no fancy ribbons for Sisko?! Just look at his longing expression… he totally wants a trophy. And he deserves one, too, he’s the *bestest* dog of all dogs anyway! Best gait. Best begging eyes. Best humour. Best technique to open doors (quiet and stealthy does it!). Best macho pose. Best puppy-rearing skills. Best everything!